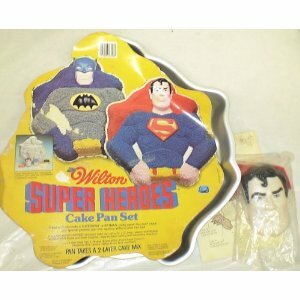 I was always fond of the Batman and Superman cake molds from the 70's and always wished my Mom would buy them and make me a Batman cake, darn it. Unfortunately, that never happened. However, I have had tons of Batman themed cakes over the years. So, no complaints there. My nephew, who will forever be my Robin, posts out of the blue Batman and Star Wars pics, collectibles, toys, etc. regularly on my Facebook page and he always finds the coolest stuff. 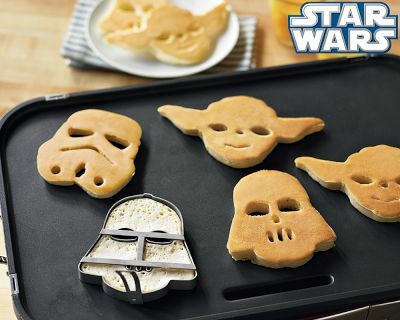 The latest are these Star Wars Heroes & Villains Pancake Molds. Not exactly toys, but definitely collectibles. These are available from Williams-Sonoma for $19.95 and include molds of Darth Vader, Yoda, and Stormtrooper. I'll do the cooking...just bring the syrup. Yum!